Superb Private Collections Highlight European Furniture & Decorative Arts Auction at Skinner This January | Skinner Inc.
BOSTON, MA – December 19, 2014 – Skinner kicks off the new year with a robust auction of European Furniture & Decorative Arts on January 10th in Boston. From several important private collections, including the Stillwell Collection of Doulton, Part II, in addition to a wonderful selection of Fine Silver, more Fine Ceramics, furniture, paintings, glass and sculpture, discover an array of treasures to add to a collection or enhance your space. On the heels of its first auction of the Stillwell Collection of Doulton in October, Skinner is pleased to offer Part II of this remarkable assemblage. 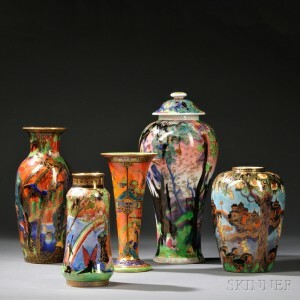 Captivated by the beauty and artistry of the late 19th and early 20th century, collectors Linda and Al Stillwell gathered exceptional vases and figures in highly decorated Doulton stoneware from all over the globe, including numerous examples by celebrated artists such as George Tinworth and Hannah and Florence Barlow. A large Martin Brothers Stoneware “Wally” Bird Jar and Cover, England, 1882 (Lot 218, estimated between $10,000 and $15,000) is sure to excite in its first appearance at auction. Also highlighting the auction’s largely English offerings in fine ceramics are strong collections of Wedgwood: the Barron Collection; the Twinight Collection, and two private Midwest collections of Fairyland Lustre. German porcelain includes a striking, late 19th/early 20th century hand-painted plaque depicting Mary Magdalene, after Pietro Antonio Rotari (Lot 596, $800 to $1,200), in addition to an extensive Meissen Blue Onion pattern dinner service (Lot 275, $900 to $1,300). Skinner presents the opportunity to own a piece of a Scottish castle with The Estate of Sir Alasdair Thomas Ian Munro. Munro (1927-2014). The sixth Baronet of Lindertis was born in London and moved to Vermont in the mid-20th century, where he became an importer of Scottish antiques and the director of the St. Andrew’s Society of Vermont. An intriguing 18th century collection, the assortment features over fifty lots of furniture, fine porcelain and family portraits. 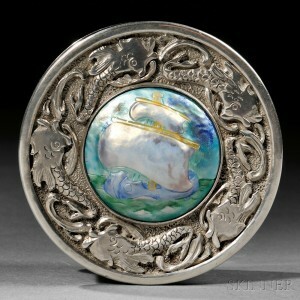 More than 160 lots of American, English, Russian and Continental silver shine in the January auction. Leading a section of American silver are examples from Tiffany & Co., including two inscribed silver presentation pieces, c. 1864, given to Capt. D.B. Barton of the Steamship Columbia (Lot 66, $800 to $1,200); a beautiful custom-made Gebelein sterling silver flatware service, Boston, c. 1934 (Lot 114, $5,000 to $7,000); as well as a sterling silver and enamel box by well-known mid-century Cleveland silversmith Mildred Watkins (Lot 130, $2,000 to $4,000). Russian silver is well-represented by two colorful pieces of enameled silver by Feodor Rückert (Lots 60 and 61, $500 to $700 and $1,000 to $1,500). Strong continental silver includes a six-piece Jean Puiforcat .950 Silver Tea and Coffee Service, Paris, c. 1925 (Lot 46, $12,000 to $18,000), while a pair of George II Sterling Silver Bowls, 1747-48, highlights English silver at auction (Lot 2, $2,000 to $4,000). An excellent selection of 80 lots of furniture is led by an attractive, late 19th century Herter Brothers Aesthetic Movement rosewood mirrored dresser (Lot 567, $3,000 to $5,000) and two mid- to late- 19th century Anglo-Indian rosewood pieces (Lots 739 and 740, $2,000 to $3000 and $1,000 to $1,500). 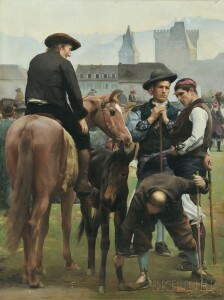 Two large-scale oil paintings on offer include Joseph Auguste Rousselin’s La Foire de la St.-Martin à Pau, 1885 (Lot 459, $30,000 to 50,000) and Georges de Geetére’s The Harem Guard (Lot 732, $20,000 to 30,000). Among exquisite glass items at auction are a set of eight 18th century English stained lead glass panels depicting the tale of Robin Hood (Lot 508, $2,000 to 4,000). Exceptional sculpture and bronze figures – exemplified by a Charles-Rene Saint-Marceaux seated figure (Lot 649, $800 to $1,200) – round out the auction’s decorative arts offerings. Previews for the auction are free and open to the public, and will be held on Thursday, January 8, from noon to 5 P.M., and Friday, January 9, from noon to 8 P.M. Illustrated Catalog #2776B is available from the Subscription Department, at 508-970-3240, or from the Gallery. Prices realized will be available online, at www.skinnerinc.com, both during and after the sale. The Skinner website enables users to view every lot in the auction, leave bids, order catalogs and bid live, in realtime, through SkinnerLive! This entry was posted in News and tagged American silver, doulton, English silver, european furniture, Fine Ceramics, Fine Silver, Georg Jensen, George III, Louis XVI, Napoleon III, parian figures, porcelain, pottery, silver trophy, Stillwell, Stuart Slavid, tapestries, tapestry, textiles, Tiffany & Co., William IV, yacht clubs, yacht trophy, yachting history by Skinner. Bookmark the permalink.